For all the talk of Share the Road and Equality and supporting all modes of travel, Los Angeles falls so short on the most basic of accommodations for cyclists that it is acutely evident that there are two castes in LA, those who arrive in private automobiles and those who don't. Those who arrive on foot, by mass transit and on bicycles are definitely the square pegs in a society full of round holes and those in charge continue to greet us with suspicion and hesitation and often simple contempt as the non-motoring public continues to assault the stability of the community. On Tuesday night, flush with victory after sitting through hours of LA Bicycle Advisory Committee meeting, several cyclists rode from the LAPD's Parker Center (a facility that has a new "wave" bike rack which fails the city's bike plan specifications for adequate bike parking) in search of sustenance and nutrition. The cyclists rode the deserted streets of downtown LA and found themselves at 5th and Flower which features Weiland Brewery Underground, a wonderful restaurant and pub that serves great food long after the rest of the downtown dining opportunities have closed shop. The Weiland website also features abundant driving instructions and directions to the automobile parking. As for bikes, not a mention. Arriving at 5th and Flower, the cyclists crossed a fairly deserted and typical downtown business district courtyard and elected to access the underground community from the south side. With no bike racks near the entrance, they locked their bike to a rail that surrounded the courtyard and that already hosted a couple of bikes. They chatted with a security guard who wore a blazer and carried a clipboard and grew confident that this was a safe place to lock their bikes. Then "Gilbert" appeared. With a smile on his face he informed the cyclists "If you leave your bikes here, they will be gone when you return." Thinking he was referring to the safety of this area, the cyclists looked around but it was well lit, it was close to the entrance, it was in the most traveled area of the entire complex and there were already bikes there indicating that others also considered it to be a safe place. Gilbert clarified "If you leave your bike there, we will cut the locks and take them." Under what authority does a security guard threaten to impound personal property? This community is notorious for bike thieves and the community policing map for the area indicates that 5th and Flower is the best place in Los Angeles to donate your bike to those who do not fear the presence of "Gilbert" or any of his blazer-wearing, clipboard-carrying team of "Just say No!" greeters. Why can't they treat those who walk, ride or take mass transit with the same respect as those who arrive with thousands of pounds of personal property? If a motorist parked his car illegally would "Gilbert" and the clipboard team break in and roll the car off into City National Plaza McGuire impound? I think not! This particular property is the home of Fixing Angelenos Stuck in Traffic (FAST) a non-profit organization addressing congestion in Los Angeles. The Chairman of FAST is James A. Thomas, President and CEO of Thomas Properties Group, which has an interest in the City National Plaza. What type of disconnect is there if the guy who owns the property and runs the organization is funding the RAND report that advises our leadership on ways to reduce congestion while "Gilbert" does everything possible to make sure that those who bring their bikes are treated with contempt and threats. Why would I attempt to bring hard earned money to the tenants of City National Plaza if guys like "Gilbert" are just doing their job, reminding cyclists that they are 2nd class citizens who stand to lose their personal property if they choose to secure it within 50 feet of the entrance to the establishment. On Wednesday night a group of cyclists, including a "newbie" who was on his second big time adventure on his new bike, journeyed to the Linwood Dunn Theater on Vine, part of the Academy of Motion Picture Arts and Sciences, a fantastic organization with a lot to be proud of including the documentary series which featured The Garden. The Linwood Dunn has no bike parking and the Academy Security staff instructed the "newby" to put his bike alongside the hand rail on the entrance ramp. (This was a crime at the City National Plaza!) Upon entering the building the first Blue Shirt promptly instructed the cyclists to put their property including the water bottles back in the car. When it was pointed out that cyclists rarely also have cars, four Blue Shirts scratched about a bit and wondered aloud what to do next. They elected to take the water bottles (nice metal canisters) refusing to allow the cyclists to simply empty them and then looked at the array of bike tools as if they were oddities from another civilization. Bottom line, the Blue Shirts seem to think their job is to say "No!" and that advancement comes with their enthusiasm for saying "No! No!" The Linwood Dunn Theater is in the middle of Hollywood and one would think that as we look for ways to encourage people to walk, ride or take mass transit, the simplest thing we could do, would be to welcome them as they reach their destination rather than look at them as if they are 2nd class citizens who dare to challenge the primacy of the motor vehicle paradigm. In fact, Moray Greenfield, Director of Operations for the Theater explained "It's Los Angeles. Of course we're going to tell people to put their belongings back in the car!" The Linwood Dunn Theater is in the middle of some sort of remodel or construction work which means that they should have a building permit. The Certificate of Occupancy will then depend on the property being brought up to code, which will include bike parking at 2% of available automobile parking and as close or closer as the nearest handicapped parking space. Ultimately, cyclists don't need a lecture on private property everytime they ask for routine accommodations, they simply need some respect. When the operator of a facility asks cyclists to simply accept the policy of the property owner, it's more than appropriate for the cyclist to ask the property manager to comply with municipal code. A little respect would prevent dueling policies and codes and allow us to work together to make sure that Angelenos have multiple choices and opportunities to select the mode of transportation that suits them best. At the minimum, a little respect for everybody, even the 30% who don't have access to a motor vehicle. After the excitement at the Academy, the cyclists took off for the Palms on Hollywood Blvd. where the security guard said "Don't lock your bikes to the railing, put it in the garage out back." Of course, this means using the wheel-bender bike rack that prevents the frame from being secured, that uses the wheel to support the bike...in other words, no. The manager on duty simply rolled her eyes and told the security guard that it was alright for the cyclists to lock up to the rail, in plain sight of the front door and close to the traffic area. She had been through this before, apologized for the property owner's idea of bike parking and welcomed the cyclists to the restaurant. What's it going to take to encourage people to ride bikes in Los Angeles? A little respect, a little accommodation and an end to the 2nd class treatment for those who dare to move about Los Angeles on foot, on a bike or by mass transit. 21210. No person shall leave a bicycle lying on its side on any sidewalk, or shall park a bicycle on a sidewalk in any other position, so that there is not an adequate path for pedestrian traffic. 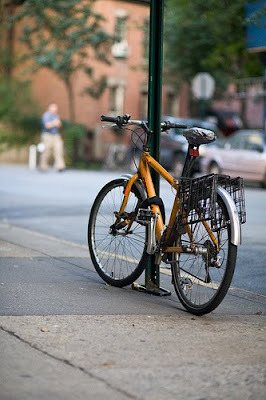 Local authorities may, by ordinance or resolution, prohibit bicycle parking in designated areas of the public highway, provided that appropriate signs are erected. Added Ch. 751, Stats. 1976. Effective January 1, 1977. Well we have LA Muni Code on our side and City National Plaza and the Academy are already scurrying to mend their wicked ways. Bike parking isn't an option, it's a right supported by muni code. Speak up and help our partners welcome cyclists as Transportation Solutions! Then I will have to note all the times in LA which I see No Bike Parking signs which site 21210. I've seen quite a few. I'd love to see this list of No Bike Parking" signs but it's kinda off-topic. In all three incidents, I'm referring to bike parking on private property, at businesses with Certificates of Occupancy that require them to ahdere to Muni standards including providing basic minimum bike parking. City National Plaza, the Academy and Palms all accommodate motor vehicles according to code, why do they ignore bikes? Because we allow them to get away with it. Stay on topic and address the failure to adhere to LAMC. I'm not asking for the right to leave my bike lying on its side on a sidewalk not am I addressing the restrictions of 21210. But I am asking for adequate accommodation. That is not precluded by or addressed in 21210. Bike racks, bike parking, according to the standard of Routine Accommodations, according to the LAMC, according to the City of LA's Bike Plan. None of this contradicts 21210. I risk life and limb on the route-Manchester to Rosecrans on Aviation blvd.Police tell me they will not ticket me for sidewalk use since most drivers are exceeding the 40 mph limit.No sidewalk in airport area and several curb cuts missing. .Councilman Rosendahl talks the talk-"Biker Friendly"It's time to act. Thanks for taking a stand Stephen. I was going to bribe the guy to have him keep an eye on our bikes and you were busy telling him what to do with his "policy" of theft. maybe it could solve our city's budget crisis if they fine all these businesses for inadequate bike parking.